While cruising around Auclair's Market in Somerset yesterday, Mom and I took a quick peek at their lovely dessert tables. 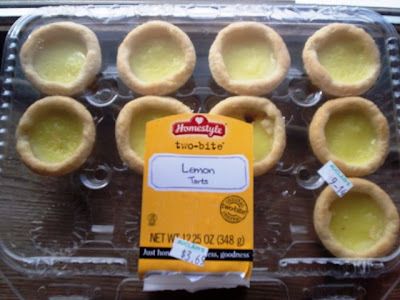 We spotted a plastic container of Homestyle Two-Bite Lemon Tarts ($3.69). These tiny, yellow circles looked absolutely delectable in their little compartments, so of course, we added them to our cart. 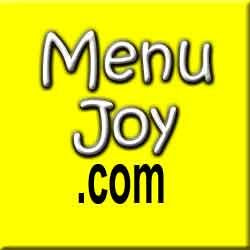 Since we adore lemon desserts, Mom and I figured that they would be perfect to serve after a lovely Sunday dinner. THE VERDICT: They didn't make it to Sunday dinner. In fact, when I woke up this morning, one of them hadn't even made it to Sunday. Sacrificing myself, I grabbed one before breakfast so that I could have something to write about before they disappeared. When I compared notes with Mom, who had devoured the missing bite last night, we both agreed that they were outstanding. It was like eating lemon meringue pie without the meringue. The crust was flaky and soft, and the lemon filling was both sweet and tangy. Out of the twelve tarts that were originally in the tray, we have seven left. Although I don't know how long these seven are going to last, I do know that we would definitely buy these lemon tarts again - but not while we're on a diet. We can't leave them alone! PS - It took both Mom and I three bites to eat the tart - not two. Liars!